There isn’t really much to say about the Spirit IN839 treadmill because honestly, I don’t think you should even consider buying this treadmill. With its low quality, poor features, and bad engineering, this treadmill is currently Spirit’s worst treadmill. Although it is priced below $1,000, I still think that there are dozens more treadmills out there with lower price tags that would give you more value for your money. See our best buy treadmills page if you want to look for alternatives. You’ll get a 1.25hp motor which would only be useful for slow walking. It reaches speeds of only 6mph. Again, this speed is only good for walkers. It offers some kind of resistance through its incline feature, but you'll have to elevate the machine manually. The running surface has a 14” width and 46” length. Most people would not be comfortable exercising on this restricted space. The rollers are 2” which in my opinion is also too small for a treadmill. With other cheap treadmills you'll get at least a 90 day warranty. But this treadmill doesn’t have any warranties whatsoever. This just proves that this machine is a problem waiting to happen. Also don’t expect any programmed workouts from this unit. Don’t even expect to get any kind of cushioning from the tread belt. There’s too many to mention them one by one here. Just remember that this treadmill provides one of the worst values for your money. I would definitely not recommend the Spirit IN839 treadmill. If you really want an entry level treadmill, visit our Smooth 5.15P treadmill review. 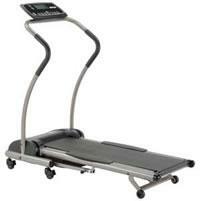 It is currently our best buy treadmill below $1,000. Belt Size: 14" x 46"
If yo still interested in ordering this unit dispite all its potential problems, then i suggest getting it from Amazon.